Sparklers light up a summer evening with their crackling glow and trail of light. Kids of all ages are in awe of the sparks that fly around the Fourth of July celebrations. These wire sticks are dipped to about two thirds of its length in a mixture of chemicals and metals. 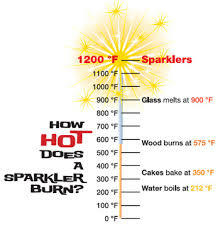 Oxidizers fuel the sparkler and keep it burning at temperatures that can reach more than 1200° F. Metal flakes in the mixture cause the sparking and glow that sparklers are known for. Sparklers are often thought to be safer than fireworks, however, during the excitement of Independence Day celebrations, it is easy to overlook their hazards. 1. Never hand a lighted sparkler to another person. Give them an unlit sparkler and then light it. 2. Hold only one at a time. 3. When using sparklers stand at least six feet away from each other. 4. Never use a sparkler when sitting down or holding a child. 5. Be aware that sparks can ignite clothing, so avoid loose fitting clothes that could catch fire. Closed-toe shoes help prevent foot burns. 6. The sparkler wire stays hot long after the flame has burned out, so drop the used sparklers directly in a bucket of water. KEEP YOU AND YOUR FAMILY SAFE. LEAVE FIREWORKS TO THE PROFESSIONALS.